The seven chakras are the points that energy flows through in the body. When open and balanced, energy moves freely through them and spiritual and physical healing can occur. However, when the chakras become blocked, it can cause mental and physical disease. A blockage in the crown chakra can lead to spiritual malaise and other problems. The crown chakra, known as Sahasrara in Sanskrit, is the seventh major chakra. It is located on the crown of the head and is associated with spirituality. 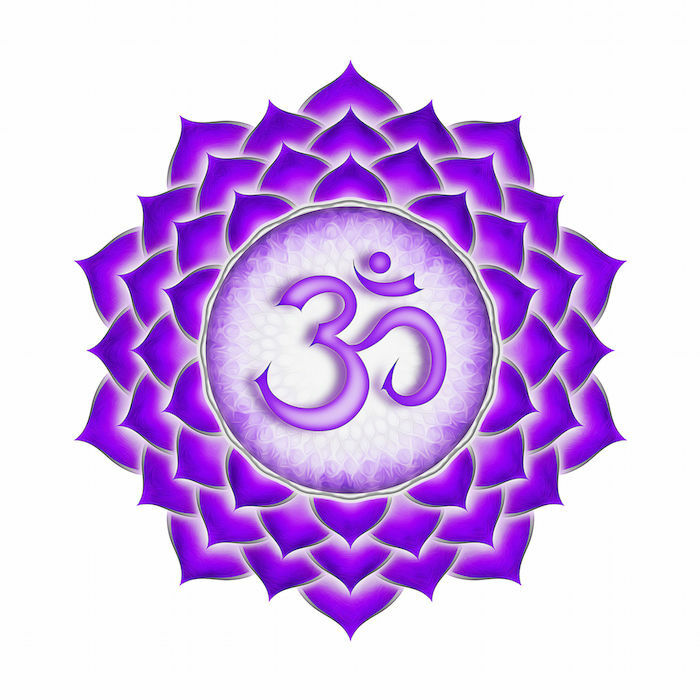 The Sahasrara chakra is violet or white, and is represented by a lotus flower with a thousand petals. This chakra is what allows people to move beyond individual materialistic needs to connect with the universal whole. Opening the crown chakra brings spiritual insight, mindfulness and the ability to live with quiet self-confidence in all aspects of life. An unbalanced crown chakra can also play a role in learning disabilities, comas, sleep disorders and mental illness. Unlike other chakras, the crown chakra does not have any healing food specific to it. This is because of its role in spiritual nourishment. Nurturing the body with wholesome, healthy foods while focusing on spiritual things can help heal this chakra. Silence is best for crown chakra activation, because it does not distract from spiritual practice. The sound of Om and deep, tonal sounds can also be healing music for Sahasrara because of their universal nature. Most yoga asanas are useful for crown chakra balancing because of the meditative aspect. Slow practice that allows time for plenty of focus on the breath is ideal. This is not the time to push boundaries and strive to achieve difficult poses, but rather to work on mindfulness and meditation. Using chakra stones such as Selenite, Clear Quartz, Amethyst and Diamond can also be an effective way to heal the crown chakra. Aromatherapy for the crown chakra encompasses a wide range of scents. Flowery essential oils like jasmine, rose and lavender can soothe an overactive crown chakra, while more pungent essential oils like sandalwood, frankincense and myrrh can help stimulate an underactive or blocked Sahasrara. The crown chakra’s elements are thought and light, so spending time in the sunlight is good for opening the crown chakra. Reading or doing puzzles outside on a sunny day is an easy way to help heal the crown chakra.